I decided to apply to Pets as Therapy as William like all Cockapoos has a lovely friendly nature and loves meeting people. I sent for an application pack which contains all the information you need. You have to fill in a form and give the names of two referees. You are given a local contact who will arrange to do an assessment on the dog. This includes walking nicely on the lead, being handled, grooming and able to take treats gently. I was nervous when it came to our assessment but William just thought it was great fun and passed with flying colours. Even the walking on the lead!! After a wait of several weeks I was told that we had been accepted so I then had to contact the local co ordinator to sort where we could go to visit. I started to visit the Bramingham Centre in Luton which is a day centre for adults with learning difficulties. The clients were very excited on our first visit and it has been lovely to see how their confidence with William has grown. William gets so excited when we arrive and likes nothing better than to try and get on their laps especially if they are in a wheelchair. After a few weeks I was asked if I would visit a special needs school. I started to visit one class but was soon asked to visit a second class. As well as the children having contact with William they have also been learning how to look after a dog. Again it is lovely to see the way that William interacts with the children. Some of them refuse to move their arms when they have physio but will reach out to touch William. One of the children is partially sighted and William seems to sense this and will go and sit right next to them so they can feel him. We were all really moved one day when a boy started crying and William just went up to him a put his paw on his lap. I would encourage anyone who thinks that their dog might have what it takes to apply to Pets as Therapy as it is so rewarding. 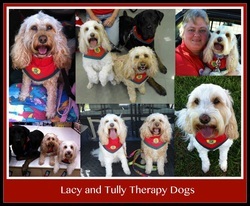 One of our members Barb who owns 4 cockapoos and comes from Australia two of her cockapoos and Lacy and Tully are Assistance dogs . 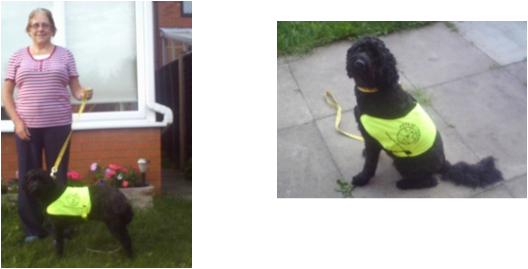 In Sept 2010 they undertook an assessment to see if they were capable of being therapy dogs. They both passed their assessments and have since then been enjoying visiting South West Health Care in Warrnambool Victoria. They love their work and all that is involved.